Most of the day is spent in nature in the grazing position, therefore head-low, with the center of gravity forward and the forehand bearing most of the weight. 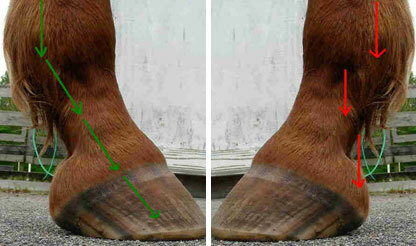 A horse who lives with the head down has more weight on the toe, and the toe wall is thicker (PicA). 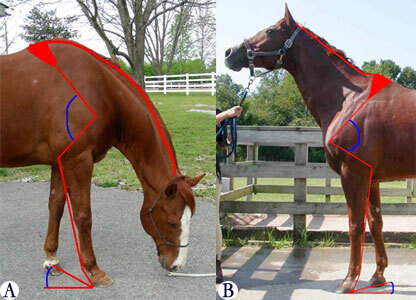 Shoulder-forearm and heel to ground angle is larger than in a horse who has the head up (PicB). A horse who lives a lot with his head up, like most horses in a stall do, has more weight on the heel, and this creates underslung heels.